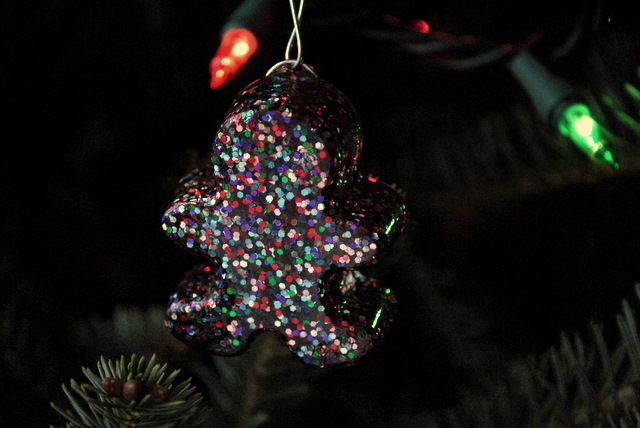 Here is one of my glittery resin ornaments! Cute, eh? I’m pleased with how they turned out. It took many more days than I expected for the resin to cure. They may even still be a little bit tacky but at least they’re not leaving resin and glitter on my fingers anymore. They even hang pretty evenly. – Resin ornaments are a quick way to whip up a whole lot of little Christmas gifts at once. Just leave them some extra time to cure completely. – If you can, pour and cure your resin outside. That stuff is stinky. – Use a fully heat proof vessel for mixing your resin. Styrofoam and thin plastics won’t work. – Don’t be afraid of resin! Once the chemical reaction is over it’s just an easy(ish) way to make cool stuff. Next up: finishing up the last handful of projects. Stay tuned!